It has just been announced this morning (NZT) that Greg McGee - who is a playwright, screenwriter, and author, but is most known to Crime Watch readers as 'Alix Bosco', the pseudonym behind an acclaimed and award-winning crime fiction series starring middle-aged legal researcher Anna Markunas - has been awarded the prestigious Katherine Mansfield Menton Fellowship for 2013. This is terrific news. Congratulations to McGee, who I have had the pleasure of hanging out with a few times at books festivals etc since he 'came out' as the mysterious Bosco in late 2011. McGee of course won the inaugural Ngaio Marsh Award for Best Crime Novel in 2010, for CUT & RUN, his debut crime novel (of course, we didn't know that he was the winner at the time - the pseudonym was quite well guarded by those in the industry, although there was much speculation and various rumours flowing about). 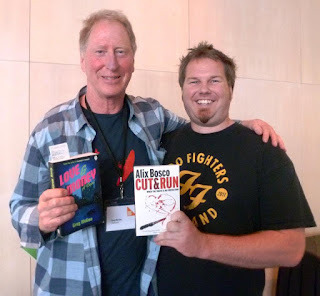 At the Auckland Writers and Readers Festival earlier this year (see pic of McGee and me above - and yes, he is one of the few authors I've met who makes me, at 6 foot 2, look small), McGee mentioned that he had contemplated at least one more Anna Markunas novel - originally he envisaged a trilogy. Hopefully winning this prestigious fellowship will allow him the time to work on such a book. It would be great to see Anna return in the near future! Penguin Group (NZ) warmly congratulates Greg McGee on being awarded the prestigious Katherine Mansfield Menton Fellowship for 2013. Greg McGee is an author, biographer and freelance writer who lives in Auckland. McGee’s first novel under his own name, Love and Money, was published by Penguin in March 2012. Love and Money is a stunning social commentary on New Zealand in 1987 as the stock market crashed. McGee’s portrait of the era is rich, funny, bitingly sharp, and disturbingly contemporary. McGee further showcases his versatility as a writer with the crime fiction series penned under the name of Alix Bosco, McGee’s pseudonym. Cut & Run (2009), the first book in this highly successful series, won the 2010 Ngaio Marsh Award for Best Crime Fiction Novel. The second book in the series, Slaughter Falls, was a finalist in 2011. McGee has written for theatre and is perhaps best known for the play Foreskin’s Lament (1980), 'the great New Zealand play'. His television credits, for which he has won several awards, include Erebus: The Aftermath, Fallout, Street Legal, and Doves of War. His 2012 biography of Richie McCaw, entitled Richie McCaw: The Open Side, further showcases McGee’s versatility as a writer. The Katherine Mansfield Menton Fellowship is one of New Zealand’s most long-standing and prestigious literary awards. It commemorates the New Zealand writer Katherine Mansfield who was born in Wellington, New Zealand in 1888 and died in France in 1923. The fellowship allows a New Zealand writer to work at the Villa Isola Bella in Menton, France for a period of six months or more in the year of tenure. The successful applicant is paid a sum which is intended to cover return travel to France and living and accommodation expenses, currently not less than $75,000. Penguin Group (NZ) wishes Greg well with this wonderful opportunity. Oh, good news, Craig. Thanks for sharing it.